I am the only child of doting parents who reacted with the same enthusiasm to my less-than-stellar high school track performances—“But you didn’t get lapped this time!” they’d exclaim, “You’re much faster than the girl with the knee brace!”—as they might if I became an astrophysicist, and if you asked them, they’d probably tell you I’m smart enough for that, too. It probably doesn’t come as a surprise, then, that I didn’t really experience feelings of doubt about my station in life until the summer before I moved to Alaska. 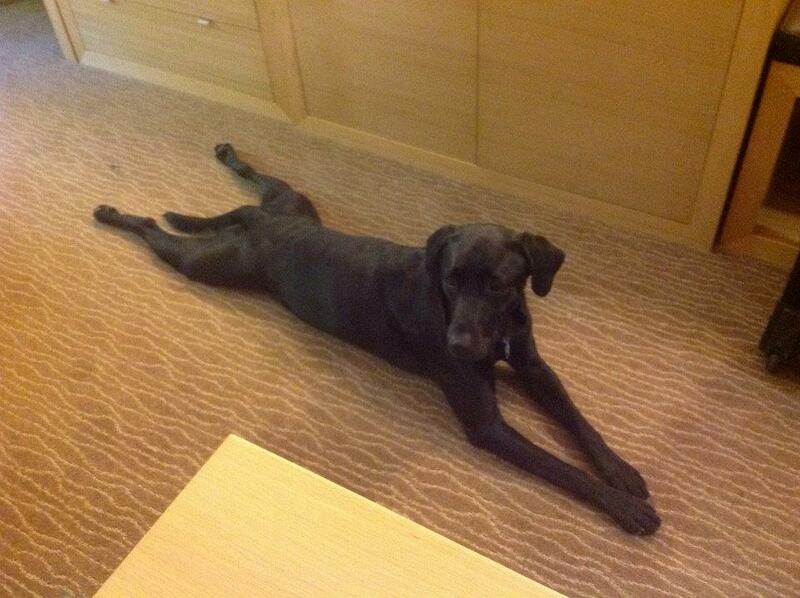 Lucky the Labrador will be heading home with the same grace and poise with which he made the journey north. Here, he demonstrates his “glad to be done driving for the day” frog leg pose somewhere in British Columbia. It was a hot summer in Colorad-bro, and my friends and acquaintances took great care to remind me that these were temperatures I’d not soon experience again, should I really go through with The Big Move. Having run out of things to do in my hometown, I’d decided to move to the Last Frontier for graduate school, and people don’t react lightly to announcements like that. “I’m bored,” I would try to explain, but that didn’t satisfy. “Get a haircut if you want to mix things up,” suggested a regular at the bar where I worked. I did that, too, and while it inspired some regret, it didn’t satisfy my wanderlust. It was Alaska or bust. It’s been nine months since I moved to Alaska’s meth capital, and as we round the corner into summer, it’s hard not to be a little nostalgic as I reflect on the differences between where I am and where I thought I’d be. Summer 2013 looked like one for the books: I thought I had a job lined up in Anchorage, and I certainly didn’t think the person up here I’d known the longest would actually be my dog. As my friends have started their summer jobs in various locales, many of them incommunicado for weeks at a time, it’s gotten a little lonely, but I chose this life, and I’d like to think I have the grit (again, stubbornness is probably more accurate) to stick with it. In any case, here I am, twenty-three years old, with half a masters’ degree in camping, in the throes of my funemployment, getting ready to pack up my Alaskan life and retreat to more southerly latitudes for the summer. There’s no shortage of things to do up here in the summertime; in my very abbreviated Alaskan summer thus far, I have hiked, canoed, climbed, mountain biked, and run, often in some combination on the same day. Don’t tell anyone—Alaskans prefer solitude—but we actually do get a summer up here, and it’s awesome. Sometimes I’m not sure I should leave. But Alaska has a way of letting you know when your time has come; it’s a catalyst like that. Last weekend, as the afternoon sun faded into the disorienting late-night light for which the 49th state is so well known, Lucky and I went for a walk and couldn’t help but be a little overwhelmed by how beautiful the scene was. (To be fair, I can only speak for myself. Lucky had lots of things to pee on and was thus underwhelmed by the scenery, even when I pointed it out to him. I guess he’s not the sentimental type.) The alpenglow lasts a long time in the Land of the Midnight Sun. Wasilla Lake reflected brilliant gold, towering Talkeetnas glowed pink, and I could hardly believe my luck that I get to live here. I can put off packing one more night, I told myself, breathing in the warm summer air and soaking up as much Last Frontier in one breath as I could. 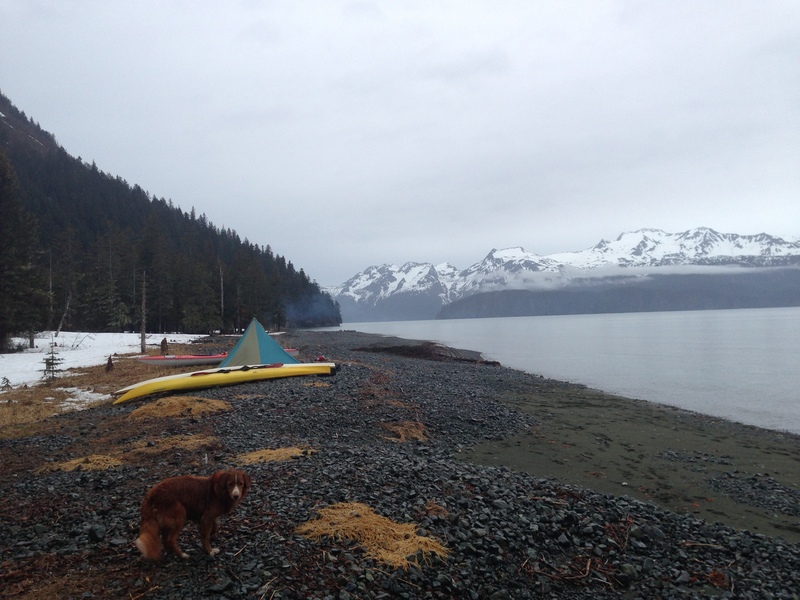 Paddling in Resurrection Bay is nice, but I prefer a state of perpetual drought. But the Alaskan summer, apparently flattered by my affections but not yet ready to commit, woke me up on its way out the door the next morning with gray skies and pouring rain. It rained all day, because Alaska does not mess around with weather (NFA). And then, as with any lover scorned, the floodgates opened and I remembered a million reasons to leave. I started to pack up the apartment. Despite the feelings of self-doubt typically associated with long-term unemployment, I feel pretty good about my decision to flee retreat for the summer. I miss my mountains. A job is waiting for me at home—really, Mom and Dad, I’ve signed a contract and everything! Funemployment has ended!—and, since said job will involve camping, it will coincide nicely with my intention to spend most nights in a tent during the next few months. It is not the summer I had planned, but it promises to be mostly outside and it’s in Colorado, and that’s a promising start.